Addiction touches all walks of life. Rich or poor, male or female, young or old – anyone is susceptible to falling into the disease of addiction. With the rates of overdose deaths steadily on the rise, it is more important than ever for those who are suffering with staying sober to be able to ask for help and live a healthy, happy life. There are several factors that may stop a person suffering from addiction from getting the professional help that they need to get sober. Whether it is fear of judgement, fear of losing a job, fear of not being there for the kids, or simply the fear of living a life without drug abuse as a coping mechanism – it all comes back to fear. If you are afraid of being judged, know that people will have judgements about anything and everything, but the majority of people will respect the fact that you are putting effort into getting better. More than likely, people will judge you more for your behaviors while you are under the influence than they will when you admit to having a problem and are seeking to better yourself. If you are scared of losing a job, there are outpatient rehab programs available that can work with your schedule. Outpatient treatment usually involves various forms of therapy that are done for a few hours several days a week, without causing you to take time off work to stay at a inpatient residential facility. In addition, when your addiction progresses, that job that you love dearly will come second to your drugs, and you may potentially lose the job. If you are afraid of not being there for your kids, ask yourself this question: are you really emotionally there for them if you are incessantly numbing your emotions and reactions through the use of mood and mind altering substances? Your kids deserve a healthy, happy parent that is emotionally available to them. A few months spent getting well is not a huge sacrifice if that means you are alive and well to watch them graduate college, get married, and have your grandchildren. The thought of living the rest of your life without drugs is absolutely terrifying, which is why people in twelve step fellowships advocate taking sobriety one day at a time. In the beginning, one day will seem scary as you are so accustomed to using several times a day. If you must, take it five minutes at a time. This fear will pass. Life does get better. 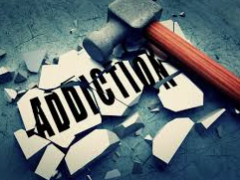 The stark reality of drug addiction is that it is a life-long battle and it is a progressive illness. To continue on with the same habitual drug use with the belief that it won’t get any worse than it already is is a complete delusion. A person suffering will build a tolerance to drugs, demand more drugs, do more and more dangerous, scrupulous things to get their drugs, and it will eventually lead them to jail or a cemetary. If you want to prevent your addiction from progressing, the best thing you can do is walk through your fear and ask for help. Those who don’t suffer from the disease of addiction won’t be able to understand or comprehend why you can’t simply just stop using drugs. This is why it is so important to form a support group of people who have been through addiction themselves. These support groups can be found in addiction treatment centers, twelve step fellowships, and even online. Being able to talk to others in recovery as well as learn from their experiences will help you feel less alone as you begin a new life without substances. Getting sober isn’t just about putting down the drugs, it is also about treating your mind and body well. It is completely normal to suffer from racing, obsessive thoughts in early recovery, but through self care practices you can learn how to cope with your thoughts in a healthy way. Some effective methods of coping with anxious thoughts that can help you stay in the present moment include mindful meditation, going hiking, playing an instrument, or doing yoga. The more you value your health, the more you will value sobriety. While in active addiction, drug users can be extremely selfish people. By volunteering in your community, you are given an opportunity to think about the needs of others. Not only does giving back feel good, but it can also promote a sense of self-worth. There is nothing more rewarding than to unselfishly give your time and love to others. Recovery is possible. Sobriety is possible. As somebody who was once hopelessly addicted to opiates, I never thought I would be able to get sober and stay sober. All it takes is the smallest glimpse of hope that other people have recovered from the disease of addiction, and if they can do it, you can too.